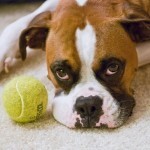 Indoor Games Your Dog Will Love | Woof Report | The best email newsletter for dog lovers. 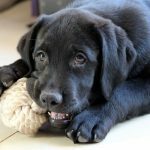 When it’s too cold to get your pup outside, engage your dog in these fun indoor games for physical and mental exercise, to relieve boredom and to have a blast together. Spring will be here soon (thank goodness! ), but it doesn’t mean the days of inclement weather are over. There will still be times when rain, snow or freezing temperatures will keep you from getting outside with your pup for exercise. And that’s where this handy list comes in. Engage your dog with the indoor games described below to offer mental and physical exercise, relieve boredom, and teach new skills. Best of all, when you play with your dog, you’ll strengthen your dog’s training skills and the bond you share too. This game will get you moving as well as your dog – it’s like interval training, and you can modify it as you like or as needed for your dog. 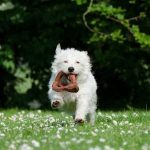 Start by jumping and dancing around and get your dog excited and playful; you can teach your dog a cue for this – “get excited” or “get wild.” After about a minute, stop and give your dog a “freeze” cue and the command “sit” or “down.” Reward your dog by starting again and repeat the game over and over. 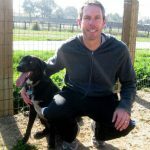 It’s fun for you both and a great way to teach your dog to respond to your cues when he’s excited. The creation of this game is attributed to Dog Fancy magazine columnist and trainer September Morn and the best indication dogs love it: it’s been shared over and over by trainers and dog owners. Dogs love this game and the ‘Find It’ variation below. Leave your dog in one room, give him the “Stay” command, and then hide in another room. Call your dog once you’re well hidden, and repeatedly if needed. Your dog will get exercise as he races around the house looking for you. When he finds you, offer of plenty of praise and a treat if you’d like. The added bonus: it will aid in reinforcing your dog’s recall. The game can also be played with two people, or played with two people to initially teach it to your dog, with one person hiding and the other encouraging your dog to find the hidden person. This easy game will be a hit with your dog. 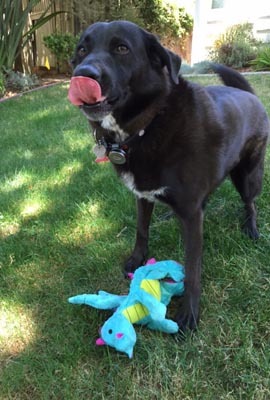 Show your dog his favorite toy, one that he usually carries in his mouth. Give him the “Stay” command and leave the room to hide the toy. 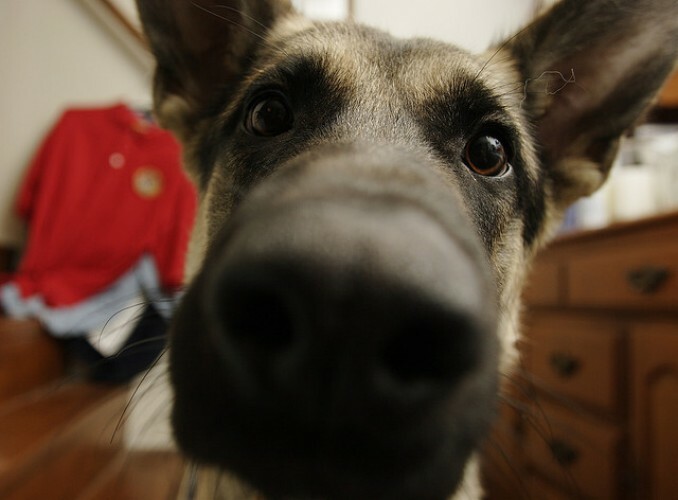 Return to your dog and tell him “Find It,’ and watch as your dog searches for the toy. If he comes back to you without the toy, urge him to keep looking, or direct him to the general area where it’s hidden. Once your dog returns with the toy, show him lots of praise and excitement and watch as he drops the toy, ready for you to hide it once again. This is one of Woof Reporter Larry’s favorite games and it’s always interesting to see him go to the usual toy hiding spots when searching for the hidden toy. You can also play this game with food, hiding treats around the house for your dog to sniff and discover, or hiding one treat at a time as you’d hide a toy. There are many fetch toys that are soft and light weight enough for a good game of indoor fetch as space permits or in a long hallway. A few of these are organic wool balls, which were featured in Woof Report in the past, Kong’s stuffed ‘stix’ or Snugga Wubba toys, which are actually designed for indoor toss and fetch games. Climbing the stairs inside your home or within your apartment or condo complex may not be the most interesting activity, but in a pinch, it’s good exercise for you and your dog both (assuming your dog is comfortable with stair climbing, of course). Woof Report Larry is compelled to race up or down a long outdoor staircase that’s part of one of our regular walks, challenging me to keep up, so you could even try mini races if your dog is up for it. When you need a break, you can toss your dog’s toy up or down the stairs to provide him with exercise. For more indoor fun with less emphasis on exercise, use the time inside to teach your dog a new trick or reinforce training skills to engage your pup mentally. 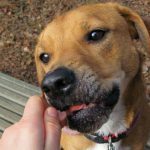 Short sessions are actually fun for your dog, especially when treats and praise are involved. 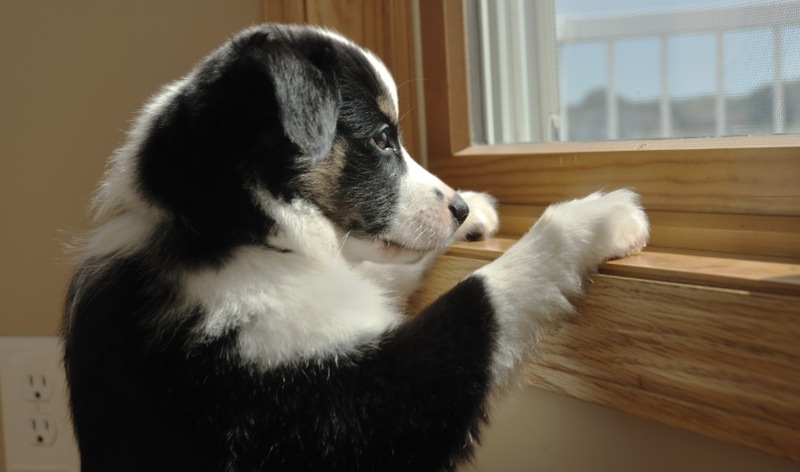 Look online for video instructions of tricks to teach or look in Woof Report’s Perfect Petiquette Tip Archives. Interactive food and toy puzzles are also good for releasing your dog’s pent up energy and for mental stimulation, they’re great fun for your dog. There’s a wide range of food puzzle toys in all varieties and for all skill levels, like those from Kong, Canine Genius, and Nina Ottosson. Fill one up with your dog’s lunch or with treats (low calorie treats like apple pieces and baby carrots work for weight-watching pups) and watch your dog get busy. 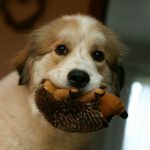 Your dog will also love interactive toys like those from Kyjen, for instance, their adorable Hide a Squirrel or Egg Babies toys. great article for indoor games!!! Wouldn’t it be great if there were any FEMALE DOGS!!!!!!! I get SOOOOOOOO tired of ‘he” as the default. How about writing an article with only SHE as the pronoun!!! !